And does motion.spindle-brake appear anywhere else in the HAL files? The earlier quoted 'net motion.spindle-brake hm2_5i25.0.7i77.0.0.output-02' doesn't exist, I just wrote that out from memory, and was incorrect. Well, there you are. That's it. motion.spindle-brake goes high whenever the spindle is stopped. If you don't want that, then just comment-out one (or both) of the lines. Gotcha. When I read the description 'TRUE when the spindle brake should be applied' I thought it was just an example use case, not the actual state being triggered. The reason I put that net in originally was so that AXIS would auto generate the brake button. Without that line AXIS shows up with no button for the brake. An option to show all buttons regardless of their corresponding use in HAL is the environment variable 'AXIS_NO_AUTOCONFIGURE'. Where should this be placed so that all buttons become visible? I think that, actually, things are already set up exactly as you need. Just un-select the spindle brake check-box in Axis and the spindle brake will no longer operate. Are you referring to this check box? If so, that's what my original question was referring to. When the spindle stops the brake is automatically applied (box is checked). I would like to disable this option so that I can apply the brake only when needed. I think it might be easier to just integrate this into a glade panel. The box is automatically checked when the spindle is turned off! 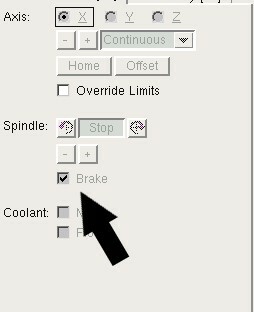 I understand that checking the box toggles the brake, what I want to change is the brake toggling when the spindle is turned off via the control in AXIS. tightmopedman9 wrote: The box is automatically checked when the spindle is turned off! . So it is! I hadn't realised that. Are you using mist coolant? You could recycle that toggle if not. use an and2 HAL component to combine iocontrol.0.coolant−mist and motion.spindle-on and then the brake would only apply if you had also toggled the mist button. Alternatively, as you say, the same setup with a gladevcp / pyvcp button, but that takes up more screen space. Last edit: 14 Sep 2018 21:10 by andypugh.